Are you ready to find more energy, more time, create more money and feel more love & certainty in your life now? Finding a certified, well experienced coach who has proven methods, strategies, systems and tools to bring out the best in you, help you heal those beliefs, stories and bad habits that are holding you back and celebrate your wins, is truly a beautiful gift. The people who coach with Tina Marie and her team of rockstar coaches are seekers … they are people just like you who are tired of just reading the latest books, listening to the latest podcasts, or watching the latest motivational video…. they are people who want true support. If you are ready to evaluate where you are, what you really want and look at a well defined plan to get you from A – Z … reach out today for our 30 minute Discovery Call. In our Discovery Call you will know if coaching is right for you. Tina Marie has developed solid programs that help in all areas of life…which one of these programs resonates with your life today? Reach out and schedule your 30 minute Discovery Call with a Certified Tina Marie & Co. Coach today. Tina Marie has coached well over 10,000 hours and has worked with people from all walks of life, and all parts of the globe. Heads of State, CEO’s, and Business Owners have retained Tina Marie’s services, as well as, individuals ready for more in life and single Mom’s healing from divorce needing to find their certainty in a scary world. In 2018, in order to serve more awesome people, just like you, Tina Marie certified experienced coaches in her methods, strategies and systems. Now her growing team of Certified Coaches can help hundreds of our clients here at Innate Chiropractic like never before. 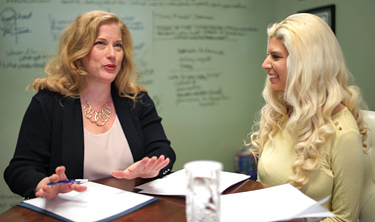 For those ready to join a small group of strong individuals creating focused personal progress and supporting each other through the journey, Coaching Circles may be perfect for you. This is a beautiful place to begin with coaching if you are finding it hard to stay motivated and desire a strong support group to help you stay focused and fulfilled. Over 15 people weekly reach out to our firm for help to find clarity, passion, direction and purpose in their career path and plan. There is no need to wait…something has brought you here now. Staying in a job that is unfulfilling is painful and will dig grooves of tolerating and settling that can become very hard to escape. The Ultimate Career Direction System developed at Tina Marie & Co is comprehensive, easy to follow and provides a step by step approach to finding the best career, becoming a great leader and ultimately feeling fulfilled in your career & life choices. Are you ready to find a new level of your own growth and progress? Are you interested in learning the most advanced human dynamics strategies & methods that will help you in all areas of your life? Imagine having relationship, health, financial, business & personal certainty, energy & fulfillment? Imagine up leveling your life across the board? You are a leader, you demand a great deal of yourself and of your teams. Who can you turn to? Do you know if you are utilizing the latest in human dynamics strategies to increase your effectiveness and edge? As a leader in today’s world you know that there are skills to perfect, and plan stop aim that will get you to your destination faster. You need a partner on your side with resources, resourcefulness, skills, strategies, and the energy to keep you primed and progressing. You work harder than anyone on your team. Your passion cannot be measured or driven out. When you are “ON”…you can move the world. Not only are you building a business, your mind is in optimization mode, forever creating. You demand the best of yourself and of your team. How do you move out of being the business operator and into the true business owner role? How do you replicate yourself and allow your team to run the show? How do you trust and step into being the “builder”, not the doer? You probably dream of expanding from where you are to where you know you could be. How do you stay relevant? How do you you are making the progress that is needed? Who do you trust with your vision? Who can soar as high as you do, challenge you, and keep you grounded and moving forward all at the same time?